Many of us are reluctant to bring politics into the classroom. In the past, this may have been advisable. But now that xenophobia and misogyny are a mainstream political stance, I think it is irresponsible. This election puts those looking to avoid discussing politics in our professional lives in an uncomfortable position. Is denouncing hatred being partisan? Could we be jeopardizing our careers by endorsing tolerance? What’s important to recognize is that we do not actually avoid sending messages by remaining silent. In this climate, where intolerance is on everyone’s mind and fear is palpable, silence is an active and conspicuous choice, just like speech. If we avoid mentioning xenophobia because it is now political, we should be wary of implicitly endorsing it. If we don’t denounce the real threats faced by many of our students, we risk implying that those threats don’t matter to us. If we are going to send a message regardless, we might as well make it one of solidarity. As teachers, this is a professional responsibility. Many of our students will now have to divide their energy between studying and worrying about the risk of deportation, hate crimes, being entered into a Muslim database, losing workplace protections, losing reproductive rights and/or losing access to healthcare. If we inadvertently foster the wrong kind of environment, we are contributing to the negative impact this will have on our most vulnerable students’ learning. In many cases, these will be the students who have the most to gain from an education. We should use our position of power to mitigate this as much as possible. The current climate of xenophobia and intolerance is not new. What is new is that it has been legitimized in some sense, and its proponents have been empowered. At a university with so many ties to immigrant communities, we will be especially affected by this. From now on, we should regularly tell our students that we welcome them for who they are, that we celebrate our differences and that we support their right to study and live without fear or anxiety. We should list the most vulnerable communities by name: African Americans, non-citizen residents (both documented and undocumented), Latinos, Muslims, women, LGBTQIA people, and those who rely on the Affordable Care Act for their well-being. We must make sure they know that they are welcome and valued here at UCSD. They will not know unless we tell them. And they will notice if we say nothing. 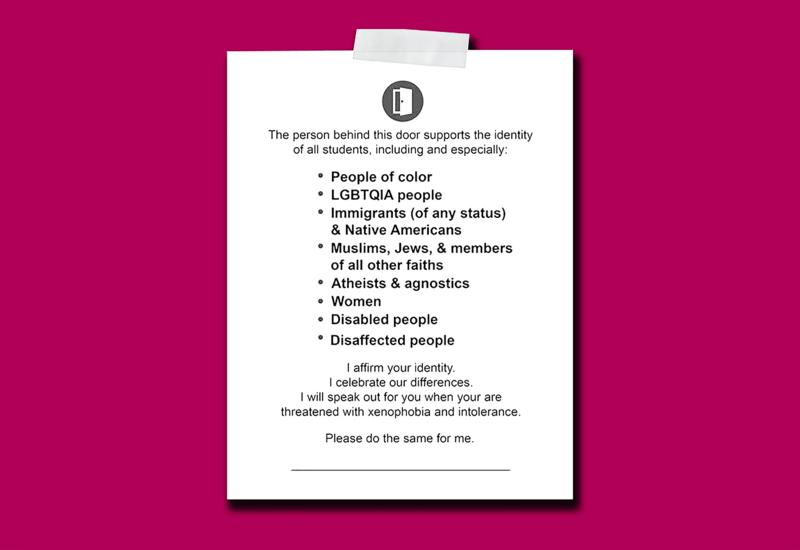 I have a sign on my office door that affirms all of my students and lists threatened communities by name. In addition to talking to your classes, I encourage you to post similar signs, and to keep them up. Adam Morgan is a graduate student in the Psychology Department. you know you live in an age of terror when even the silent are being burned with gas by the fanatics on both sides.